"No Event To Small. Work Anywhere, Anytime"
Whether you need a DJ for your wedding or your child's party, Puresounds could be the perfect choice for you! With over 250,000 karaoke songs (optional extra) to choose from and a professional light show, lasers and effects. Children's parties - weddings - engagement parties - corporate events. Help make your event or party a night to remember with Puresoundz. We have a quality modern light show, lasers and effects for you to enjoy along with music from the 50s to the present. We have water based / scented smoke machines so it is very unlikely that smoke alarms will go off on your big night. This company has been running for over 15 years and done events for some big name venues. We're experienced at getting parties going in no time at all - kids too - for children's parties we can play games and give out prizes. Contact me if you need any further info. Required by many venues, Puresoundz Disco & Karaoke has a current PLI policy with Mobile DJ Network in the amount of £10 million. Also required by many venues, Puresoundz Disco & Karaoke has supplied satisfactory evidence of holding current PAT inspections of their equipment dated within the last 12 months. A Method Statement, outlining Puresoundz Disco & Karaoke&apos;s Health & Safety procedure for setting up disco equipment has not been supplied. 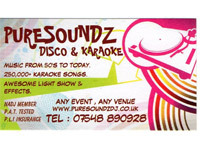 Why do people choose to book Puresoundz Disco & Karaoke? He was the first to call and he offered everything I was looking for, for the price I wanted to pay. "Was a excellent evening, good range of music. Everyone enjoyed themselves "
"Was great people to work with in all aspects." "We were rather disappointed with the fact that many of the songs we requested were cut off half way through/ not available despite being popular songs also not being able to request songs after a ceratin time even though there was another hour left. " "The songs they asked for were in mixes and in them mixes not all the song is played. When I mix it always fades out only the last 5 seconds of the song. I try to play different songs for everybody's choice not just one. I don't take requests for the last half hour." "Nigel was very good on the night arrived on time and played every track that was requested would definitely recommend him"
"Was a great event in a good venue. Very friendly people and would work for them again no problem. " "Thank you Nigel for providing our New Years Eve Disco despite being really rather unwell. Everyone was really happy with how the event went and have commented on how good the music was. Thank you again! " "Was a good event in a smaller venue than I'm used too but everybody enjoyed themselves. I was very ill that nite and thanks for the help at the end." "The DJ was below average, if you are looking for a DJ that wants to interact with the crowd then do not hire this one, the only words he said were when the buffet was open. Song requests he got right and all requests did get played although there were a few songs he played twice and one song got played 3 times, He had helpers and when I did ask for a song the DJ was outside smoking (which in our eyes was unprofessional and he did it quite a lot) the helpers didn't know how to use the software so the request never got played. when I went up to ask him what time the cake was going to be cut no one was there (Not even the helpers) Value for money was under average and at seemed a lot of money for someone who didn't interact with the crowd and had a lot of smoking breaks. Don't want to sound negative but we're trying to be honest." "It was ok that nite. I was full up with the flu and unwell and needed fresh air a few times. It was the first time I had people help me set up etc because I was ill. They now know how to use the software etc and on the night they did not tell me songs had been asked for. As I said I was very ill and the client was lucky I didn't cancel the booking all together because of this." "Brilliant night, DJ Dan was awesome. Good mixing of songs at the end of the night. Brilliant throughout. Requests no problem!!! Family and friends complimented on the DJ. Would definitely hire again and would recommend to anyone. If they are available next year my wife will book them for my 40th. Initial communication with them was also very quick and decisive, after sending the email. " "Was a great night. The client says it all. Would work for them again no problem. " "Brilliant disco. Good music choice and brilliant when we had party games. Really friendly and helpful. Only thing is I would of liked a contract or written confirmation in advance for piece of mind "
"Was a great night with loads of fun and a good crowd. I only do confirmation by text message. Great client. " "Kept the music going but didn't quite read the room right all the time. This resulted in a few occasions where the floor was empty Karaoke was good sound wise but having just a small screen tucked in at the side of the deck meant people were unable to express themselves fully when singing and a bit cramped when a duet was requested. It would have been better out in front of the setup I don't want to give the impression that this was a bad disco, far from it, but it just didn't quite click with our guests on the night which can happen I would engage Nigel again personally but I think I would have to be more specific about the music choices required"
"Yes it was quite a good night in total. I was a bit cramped in the corner but that it where I was told to set up. The room layout could of been better as I did not have enough space but that was down to the room Set up. Great bunch of people." "Nigel was expensive for his dj. When asked for song request he didn't like it and was rude on times. I wouldn't recommend to others sorry as I paid for the dj and could have the songs we wanted. His music choice was either to young and cheesy or songs that never been heard of." "I played the music that was asked for and stuck to that type of music with a few others for the younger gen. Was not rude at all even though I found it hard to understand them at times. " "I found this DJ outstanding & I would use his again so many thanks to u "
"Nigel was the cheapest dj & asked for no deposit, I wS a tiny bit worried he wouldn't show up so created a playlist (which I sent him) in case. He arrived over 2 hours early and was completely set up by the time I arrived. Mostly the party was outside as the weather was good so it must have been boring for him as dancing didn't really take off till 10pm ish but once it did he kept us on the dance floor for the rest of the night. Brilliant, affordable, great time keeping, all round good guy. Thanks Nigel :-)"
"Was all a bit boring to start off but soon picked up and really enjoyed the rest of the night. Great people and wouldn't hesitate to work for them again." "Could have interacted with the guests a bit more particularly as I gave a full list of requests for certain people with comments about memories written down "
"Played all the songs on the list at the right times. Was not told I had to say all the comments and there was a lot of them. Apart from that it was a good nite." "Music was spot on but did arrive slightly later than we expected which was enough time for set up but was a bit nerve wracking on the day thinking he may not show up as no deposit was paid! " "I was there in plenty of time to get set up and running. Was a good event with a good crowd of people." "Nigel arrived with plenty of time to spare, was very friendly and polite. He had travelled a very long way for us which he said wasn't a problem for him. Music was great, atmosphere fab. He did a great job"
"Was a good event with great people, wouldn't hesitate to work for them again. Was a lot more kids than expected but it just made it even better." "Nigel was a very friendly, professional DJ, his music, lighting and sound were ideal for the party." "Was a good event with great people good crowd. Wouldn't hesitate to work for them again." "Honestly, Nigel was brilliant! He was doing a birthday party for two 14 year old girls and knew exactly what songs to play, as well as playing mashups and remixes. Karaoke was also available for us, and it was a high quality. Thank you so much, everybody had a superb time,"
"Was a good event for 2 young girls. They all kept going throughout the party and enjoyed the few games and loved the music. Would not hesitate to work for them again." "Absolutely brilliant, everyone commented on how good choice of songs were highly recommended"
"Was a good event with great people good crowd. Wouldnt hesitate to work for them again"
"We booked for this party quite late had a few djs offer their services, one sounded good until he asked what me and my partner did for work! Don't see the relevance in that or in some of the questions that he asked, luckily for us we found pure soundz, spoke to Nigel on the phone. I heard exactly what I wanted to hear, so we booked him. On the day, he turned up early and was set up well before the party was due to start. He played some really good music and the kids (aged 16-18) thought he was ace! He even played on for a little longer because the kids didn't want the party to end! Since then I have tried to book him for another party but he was busy but I will definitely be using Nigel again and recommend him highly." "the best customers ive had in years. very helpful and polite and have worked for them again since. hope they keep in contact when they sadly move." "Nigel arrived in plenty of time and was very helpful with our requests. We had a great time." "great crowd and great people. hope to work for you again." "We had a small function room and only had half the guests turn up ( around 35 in all) and I think the lights and sound could have been toned down for the size of the room. There was no interaction with the audience and no hint of the karaoke. When I asked for requests, they were played but on a whole we were a little disappointed." "there was not many people there and most of the time they were outside. there must of been a crowd of about 10 in the room at any time." "We were so pleased with Nigel. He was exactly what we were looking for! We will definitely be booking him again, and I wouldn't hesitate to recommend him to friends etc." "was a very good event with great people. was a lot more busy than we all expected but that just made it a lot better. will work for them again no problem. thanks guys..."
"The music was good and he played the songs we requested but he was sat on his phone the whole time and didn't interact with the crowd or anything. Would recommend to a friend as a last minute low budget option"
"Was a good venue but a quiet event as there was only a hand full of people there, counted them on a pair of hands. They were dead most of the night and nobody came to talk to me about music etc and most of them was out of the room most of the night and nobody to talk too." "Brilliant DJ booked for my daughter;s 5th birthday party. Arrived on time and good variety of music." "was a good party for a 5 yr old. thanks"
Puresoundz Disco & Karaoke also offers a range of additional party services not directly linked to musical entertainment. If you are contacting Puresoundz Disco & Karaoke about an event, it's always a good idea to include the DATE, LOCATION, EVENT TYPE, AGE GROUP and TIMINGS to speed things up!